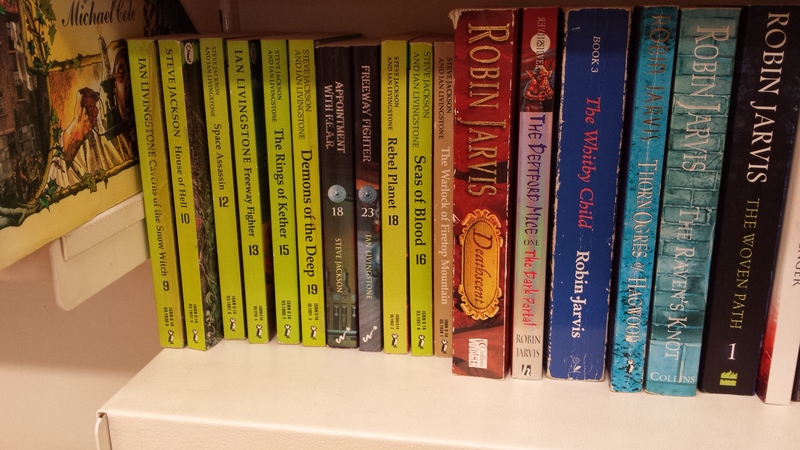 The Warlock of Firetop Mountain was a very early edition, I think it only listed the first three titles as being available in the series, but I left that on the shelf for some other lucky person. And although I have yet to add Appointment With FEAR to my collection, I’m not after the Wizard editions so that stayed there too, Freeway Fighter I have recently acquired on eBay as it’s my next book to read at the time of writing… so what did I actually pick up in the end? Handily, with these books I’ve filled an imminent gap, with my collection now taking me almost up to book 22, Robot Commando, ironically with Appointment With FEAR being the only title missing up to that point. 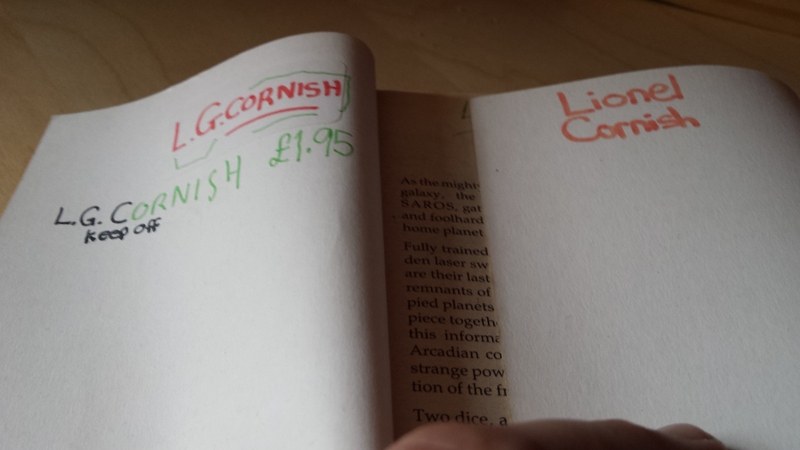 As with my previous big haul, these books appear to be from an abandoned collection once owned by a ‘Lionel Cornish’. 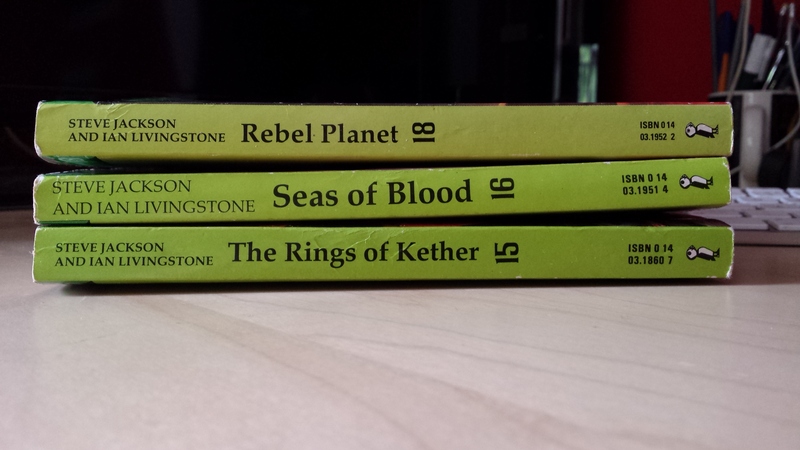 Seems Mr. Cornish once held these books in great esteem, writing ‘KEEP OFF’ on one inside cover, but then reduced his interest to the point of being willing to accept £1.95 for it. Well, they’re mine now, Cornish. All mine. Looming above your home planet is the vast hulk of the starship Vandervecken. Aboard, the crazed scientist Cyrus is planning to unleash a gruesome experiment upon your world, which will destroy all life as it is known, leaving only hideous mutations in its wake. YOU are an assassin, and your mission is to stop him – before it is too late! 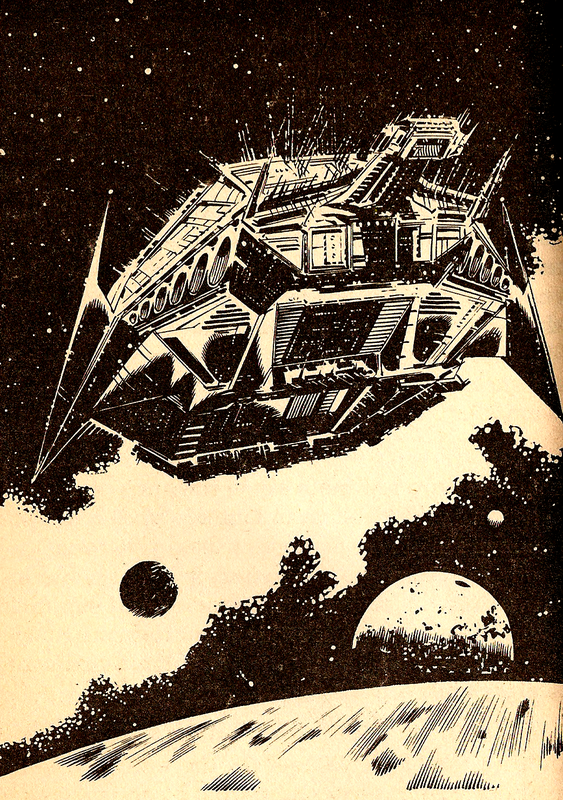 This is the Vandervecken, the immense spacecraft where utter maniac, Miley Cyrus, is conducting abhorrent experiments on humans and aliens alike. Stowing away on a supply craft, we make our way aboard, hoping to end her ultimate plans of destroying all life on our planet with viruses. We’re in luck too as we have a fairly strong character to do it with, although ironically one with sub-par Luck (12/17/9), as was detailed earlier we have some other stats to deal with too, an Armour score of 10 and 5 points to spend on weapons. I’ve gone for an Assault Blaster, which does 1D6 damage (3 points) and an additional 4 points of Armour (1/2 point each). As the supply craft closed in on the Vandervecken, I spied a small iris airlock so I lept from the supply ship and floated over to my choice of covert entry point. So far, so good. Through the airlock we go and find ourselves in a small corridor ending in three doors, on the floor was a small pile of ‘organic refuse’, so of course, I had to have a rummage through it before continuing. A six-limbed, hunchbacked skeleton lay on the floor, a bloody trail leading from its body to the maintenance hatch on my right. In its hand was a small electronic device with one button on it, wires leading up the creatures arm into the remnants of a sleeve. Yes, apparently this small rat thing used to wear a shirt. Ignoring the fact this could well be the trigger to some sort of bomb I took the device from the creatures hand only to find the wires were attached to nothing. What seemed to be missing was a power source, so I took the incomplete device along with me. A trail of blood is always an interesting thing to follow, so I went through the right door to find out where our skeletal pal had come from. What I found was soon to become an on-going theme – a long tunnel. This variety was a dark access tunnel filled with conduits and aluminum lattices cutting through the ship, this led down to another maintenance hatch off to the side, behind which I could hear muffled gurgling, the tunnel continuing into the darkness. 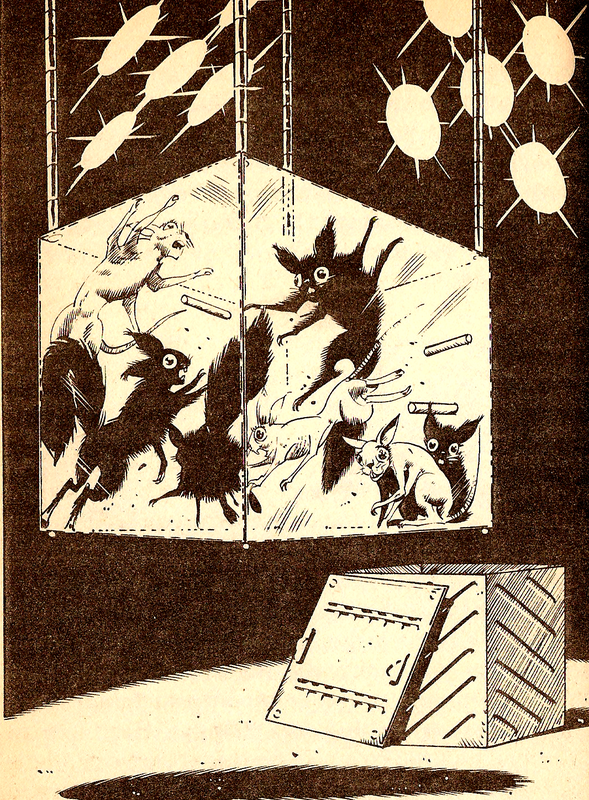 I’m going to assume that the door is where the snappily dressed skeleton came from, so I opened up the hatch. A prison area was what laid before me, a faceless robot guard stood in front of two cells, a prime target to try out my Assault Blaster on. The poor lamb didn’t stand a chance at 7/6 I easily beat him and with a damage roll of 6, I one-shot him. After having splashed out on an Assault Blaster though, I was offered to loot one off this guard, a little annoying as I could have got me some grenades instead and I’m not even allowed to dual-wield them! Regardless, I took at look at the cells, the gurgling noise was emitting from this one and inside I found a battered old man, covered in scars and stitches. On seeing the door to his cell open to reveal the smoking remains of the guard, he started to talk, mostly babble following his obvious traumatic experiences, but did relay some interesting information about the pilot of the Vandervecken. He is actually a machine, not a man and should he ask me anything about ‘thinking or feeling’ I should just reply that I ‘don’t know’. Will do. Moving onto the the next cell, it appeared to be empty on first impressions, but on closer inspection I realised I was incorrect as I was attacked by what appears to be a Furby for the cost of 1 Armour point. The thing scuttled up the wall and sat glaring at me, unfortunately I wasn’t given the option to blow it away, so I went back to the tunnel. Only a few more metres along the tunnel and I’d come across another hatch, this one feeling slightly warm. Behind the door were several large conduits running from floor to ceiling that were the source of the heat and behind them was a sliding door. Following this one through I found myself in a fashionably furnished room filled with couches and tables, and inhabited by two rodent-like beings in white lab coats sat reading electronic resource sheets. IT is a cushy job alright, but rather than blast these little guys, I decided to try and get some info from them and merely threatened them. They claimed innocence though, stating they were ‘humble scientists’ (now making me think of the South Park otters) and that Cyrus only seeks them out when he needs them, never the other way around. Curiously, I ordered them to strip (!) and tied them up. As I did this though, I found sets of electronic keys on them and was able to use them on a security door leading out of their science lounge. Another long corridor of a hundred metres or so was ahead of me and I followed it along until a door to the left distracted me. What I had been distracted by was actually just a small kitchen, but in there I managed to scavenge a high-energy bar that would restore 5 Stamina points. I should also point out something I forgot to mention earlier, Space Assassin imposes an item limit on you, excluding weapons, allowing you to carry only five at any one time. Leaving the kitchen I shortly came to the end of the corridor which culminated in a circular room occupied by a squat, tri-pedal robot armed with a pair of electric-lashes. ‘Halt: inspection point‘, it squawked at me. Having no time for trying bluffs, I opened fire on what was another easy encounter (7/6), although a very couple of rolls did actually see me take a little damage. I had a look through the remains of the robot, but found nothing except for what looked like a safe beneath its feet. Three coloured buttons were on the door; blue, red and green. I pressed them in the most logical order I could think of – red, green, blue. And yep, RGB did the trick and the safe popped open, a booby trap was waiting for me, but now disarmed I could take the Gravity Bomb and add it to my weapons collection. Ignoring the side-door, I continued straight ahead to find another long corridor, with yes, another side-door. A small library of sorts was behind here, books, microfilm, resource sheets, all manner of scientific information was available. Three volumes were left out on a table and I had time to read through one of them. My subject choices were – molluscs, neurotoxins and robots. Knowledge of neurotoxins I figured would probably not help me if I was afflicted by them, molluscs were not entirely out of the question to be attacking me on this ship at some point, but given that I’d already seen two different robotic guards, I sat down and learned a little bit about robots. Unsurprisingly the corridor continued ahead ‘for a very long while’ and the next side-door actually had a sign, ‘CEPHALO SQUIRRELS – HANDLE WITH CARE’. Space squirrels sound more fun than walking down a corridor for a long while, so I went inside. 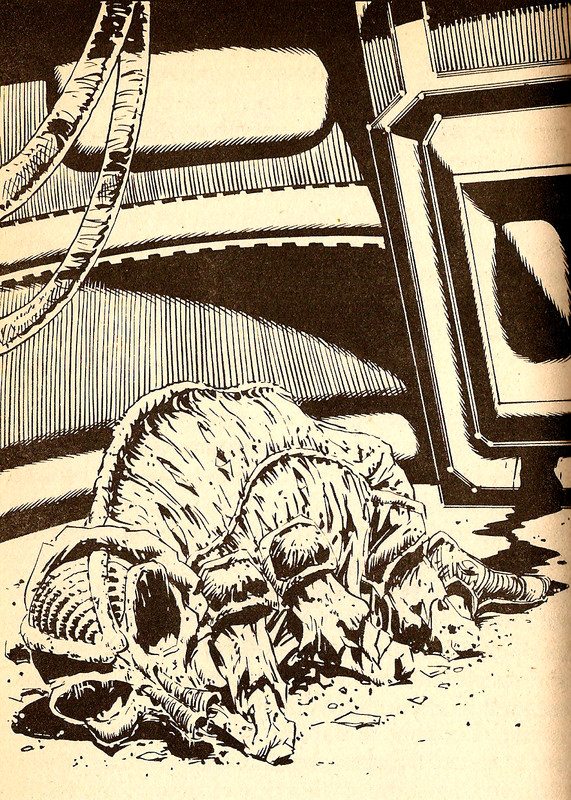 The poor little guys looked quite angry to be held within a small plastic cage, and to add insult to injury, some of them had inexplicably been shaved. What kind of monster shaves a squirrel? Cyrus, that’s who, and I am going to kill him. A tyrannical despot is bent on destroying the world! 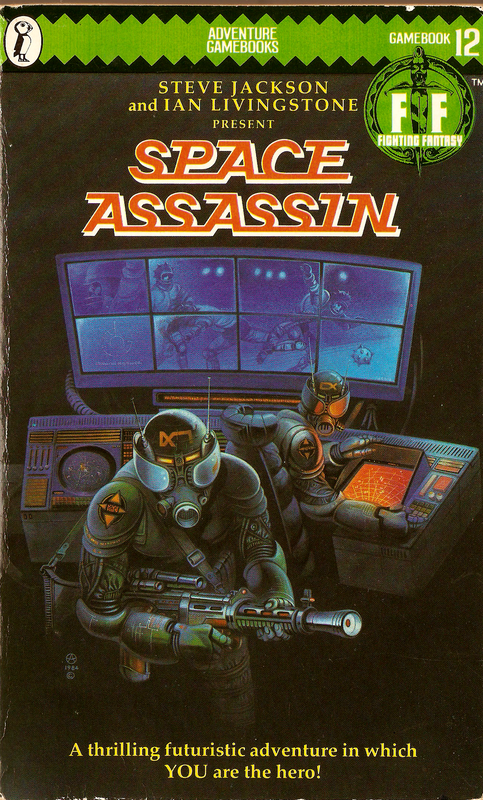 So, one of the sci-fi books… Space Assassin isn’t the best reviewed book of the series, my favourite summary on the Reviews Archive being, ‘If you see it, get it if you want, but I wouldn’t myself‘. Truly glowing. 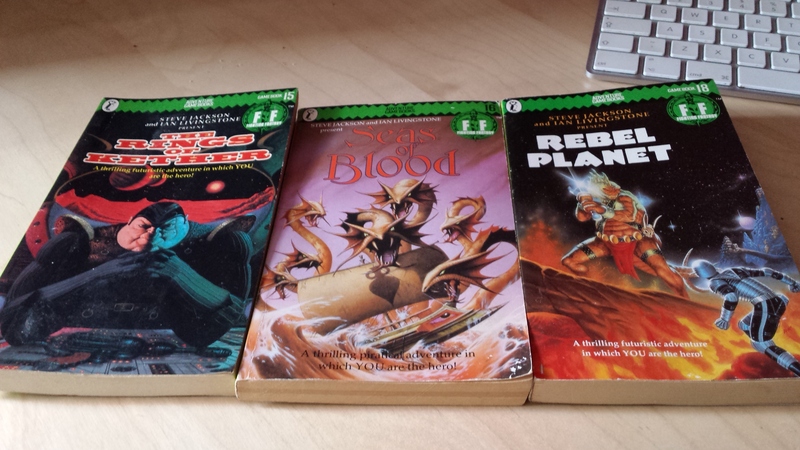 However, the sci-fi Fighting Fantasy is bad equation doesn’t really work for me as I quite liked Starship Traveller, so I will refrain from forming an opinion before I get stuck in. 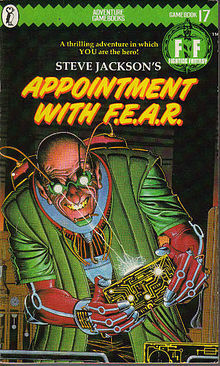 Space Assassin is one from the ‘Presents’ series, our author this time is Andrew Chapman who Titanica tells me wrote the book after reading Warlock of Firetop Mountain when that was the only Fighting Fantasy book that existed, it sat around and got moulded by himself and eventually the publishers before it ended up in its current form. Save for reading it on a train somewhere, I have no real memories attached to this book. The cover always stuck in my head I guess, I always thought the armour looked like a pretty cool offspring of Stormtroopers and 40K marine armour. In the absence of much else to say about the book before I dive in, I’m going to start detailing any special rules and a basic story set-up in the introduction before I write Part One. 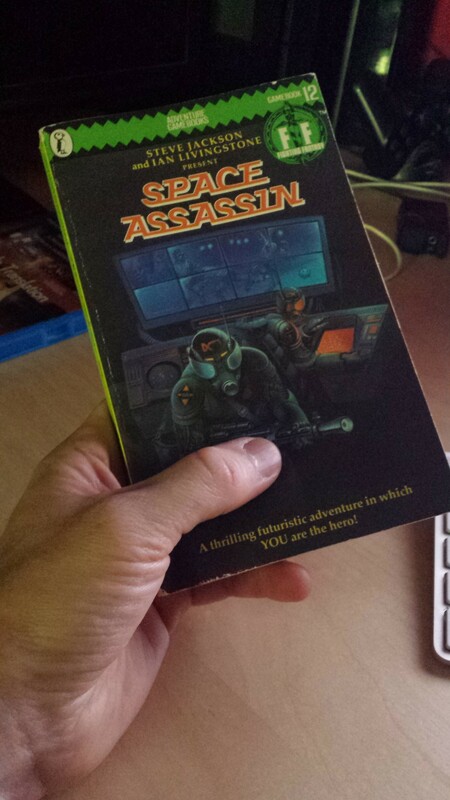 The space assassin of the title is actually in reference to you, the reader. Our target and villain of the story is Cyrus, a tyrannical scientist who has been conducting bizarre and hideous experiments on humans, creatures, whatever he can find really, he is the Space-Josef Mengele. His mutant creations and robotic cohorts guard his huge starship, the Vandervecken and his next experiment is to release radioactive isotopes over our planet which will shower deadly viruses on all living things. Armed with a variety of weapons and twenty-seven different schools of alien and human martial arts, we are being sent to stop him. 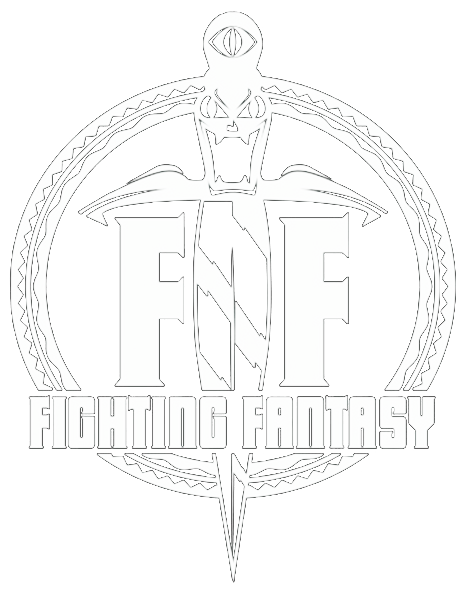 A few new mechanics are in place to represent the sci-fi setting, the most important being in armour and weapons. Armour is a 6+D6 value that works like a typical 2D6 Skill or Luck test, when you are hit in combat you roll against your armour, fail and you take damage, succeed and your armour absorbs the hit, either way you then lose one point from your armour value. This might seem to make things much easier, but some weapons can do 6 Stamina damage to you in a single hit. Weapon selection is done by spending 1xD6 points on a limited range of weapons, ranging from grenades to blasters, all doing varying damage. Provisions are also out, with Pep Pills taking their place, you begin the adventure with 4 of them, each restoring 5 Stamina and can be used at any time.